Earnings growth is still possible amidst a slowing Asian casino market, an analyst said. Genting Singapore is likely to see its final dividend inch up to $0.025 from $0.02 thanks to a growth in earnings in Q3 which the firm attributed to stronger performance of its attractions, according to DBS Equity Research. “Genting Singapore has the capability to reward its shareholders by uplifting its annual dividend to $0.04 from $0.034 when it reports its FY18 results early next year,” DBS analyst Mervin Song said. Song also noted that Genting Singapore remains in a strong financial position with a net cash balance of c.$3b. He also projected that the firm would continue to report a sustained increase in profitability over the next three years, which should result in Genting Singapore trading closer to its average enterprise-value to earnings before interest, tax, depreciation and amortisation (EV/EBITDA) of c.12x. Genting Singapore saw its Q3 profits jump 25% to $210.41m from $168.69m in the same period in 2017, whilst revenue grew 1% to $639.06m from $629.87m. According to its financial statement, its average daily visitors hit over 22,000 due to the stronger performance of its attractions such as Universal Studios Singapore and S.E.A. Aquarium at Resorts World Sentosa (RWS). Song also added that Genting Singapore’s VIP customer business could propel earnings and its share price in the foreseeable future amidst micro uncertainty following trade tensions between US and China. “Our confidence arises from the fact that Genting Singapore VIP rolling chip only stands at c.$8.27b (US$6b) and could increase by 50% but still not hit the previous peaks of c.$19.29b - $20.67b (US$14b-US$15b),” he explained. Meanwhile, its mass business which comprises of tables and slots was stable with gross gaming revenue flat YoY, Song noted. 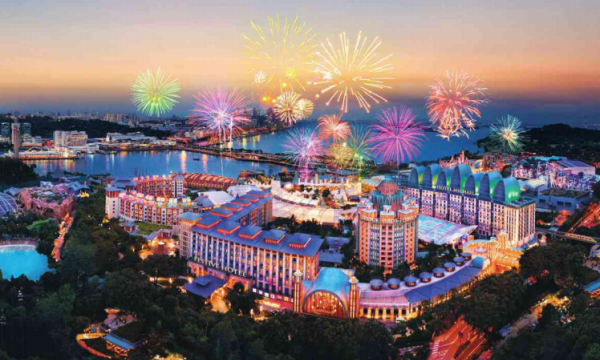 Whilst the firm did not provide details on its plans to redevelop its property at Sentosa, Song noted how Genting Singapore remains hopeful that it will be able share its plans in 2019. The report also revealed that Genting Singapore still remains in discussions with Japanese authorities and potential partners on its plans for an integrated resort (IR) in Japan. So far, only the Osaka authorities have officially announced their intention to host an IR in its city.